I'm back to working on my Good Day drawing. I had slowly been filling in some of the tree trunk color now and then, but a few weeks ago I started back in more seriously. I'm now working the background shrubbery on the right. Most of the right side is filled with bushes so I expect it will be a somewhat tedious process, but I feel re-energized and ready to tackle it. The next shot shows a little more progress. I've been using an assortment of greens, Primacolor Dark Green and Prussian Green for the darks. For the middle values, Coloursoft Green, Prismacolor Kelly Green and Jade Green and for the lights, Primacolor Pale Sage and Grey Green Light. Also some yellow greens, Prismacolor Spring Green, Chartreuse and Cinnabar Yellow. 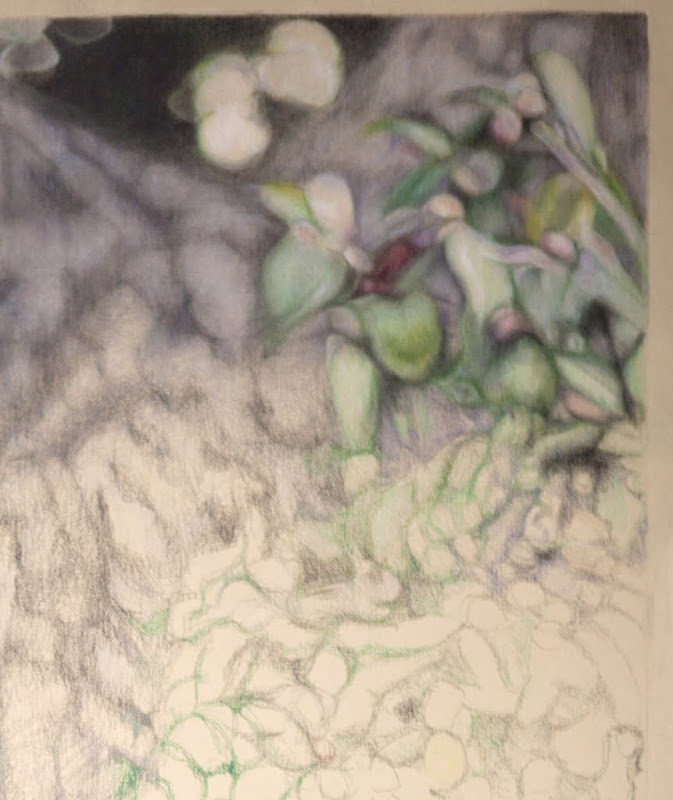 I'm using the whole array of Cool Greys for the tree trunk, plus some warm greys, here and there, and some purplish colors like Parma Violet and Blue Violet Lake. As a first step, I've been using my reference image to draw in the shapes a little better. Then I started lightly blocking in the colors to distinguish shubbery from tree bark more easily. Once everything was more clearly defined I started layering the colors, building up shapes with mostly the middle tones, but being careful not to cover up my highlight areas. Once I have enough color down on the paper I'll usually bring in my short stubby bristle brush to blend the colors together and spread them down into the paper. Then it's back to layering more color in, this time using more lights and darks to further define the shapes. I might do a few cycles of this layering and brushing until I've gotten good coverage of the paper and the colors have intensified. 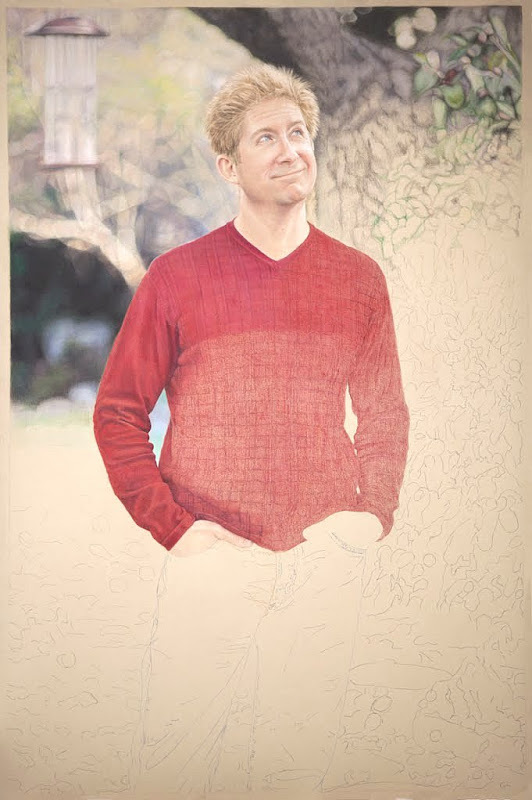 The last step will always be penciling on more color, and highlighting and darkening as needed. I've been trying to keep the shapes fuzzy to get the illusion of distance, but not are blurred as the background on the left side which is even farther back. I may have to come back later with a light color overall to add more blur. We'll see how that goes.